VIEWS OF SLIGO Bay and the neighbouring mountains. Spectacular countryside around Rosses Point. And the opportunity to surf, golf or just relax at the hotel spa… If this sounds like your kind of getaway, read on. 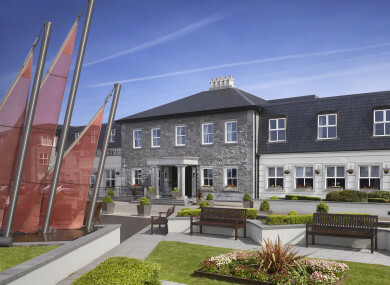 We’re giving one reader of TheJournal.ie‘s Family Magazine the chance to win two nights’ accommodation at the four-star Radisson Blu Hotel Sligo, plus dinner on one evening at the Classiebawn Restaurant, winner of an AA Rosette. You’ll also have breakfast on both mornings and complimentary access to Solas Spa with its 18-metre swimming pool and thermal suite. The beach is just 3km away, and you’ll find championship golf courses, casual food at Waves Bar and plenty more on site. If you’re not lucky enough to win, check out the autumn offers online at the Radisson Blu Hotel Sligo – including the Slip Away To Sligo offer of one night away with breakfast and dinner for €69.50 per person sharing. Follow the hotel on Twitter for more updates and offers. Want to be in with a chance of winning? Simply email your name and location to competitions@thejournal.ie with ‘Family Magazine – Radisson Blu Hotel Sligo’ in the subject line. Don’t forget to subscribe to our Family Newsletter below too! T&Cs: Prize is a two night stay in Radisson Blu Hotel Sligo (midweek only) with dinner on one night and breakfast on both mornings. Subject to availability, non transferable. Not valid Christmas, New Years or bank holidays. Full Journal Media T&Cs here. Email “WIN: Two nights in the lush Sligo countryside at the four-star Radisson Blu Hotel”. Feedback on “WIN: Two nights in the lush Sligo countryside at the four-star Radisson Blu Hotel”.